Breakfast in Coast Light hotel. Poor selection for the breakfast (only boiled eggs were the only hot foods that appealed). After breakfast, proceed to Ephesus Ancient City, House of Virgin Mary. Accordingly, it is the place where Mary may have spent her last days. Next, “Water of Mary”, located nearby, believed by some pilgrims to have miraculous powers of healing or fertility. Virgin Mary and St John were said to have lived and died in Ephesus. It is the place where Mary may have spent her last days. A water fountain or well is also located nearby, believed by some pilgrims to have miraculous powers of healing or fertility. Lastly, “wishing wall” which pilgrims have used by tying their personal intentions on paper or fabric. 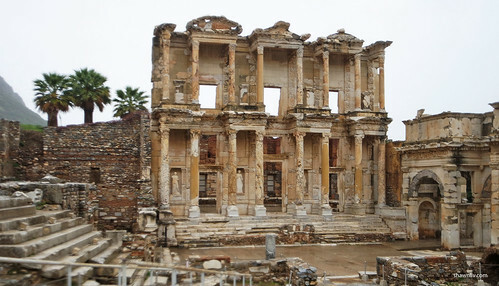 Next, Set off for Selcuk where you will explore Ephesus, one of the largest archaeological sites in existence. It was built in the 10th century BC on the site of the former Arzawan capita Accordingly, Ephesus is the best-preserved Roman city in the Mediterranean region, and it was one of the seven churches of Asia that are cited in the Book of Revelation. Mable Road : It is the road starting form the great theatre to the Celsus Library. Trajan Fountain in Ephesus : Built in around 104 C.E, it is one of the finest monuments in Ephesus. It was constructed for the honor of Emperor Trajan, and the statue of Trajan stood. Temple of Hadrian, one of the best preserved and most beautiful structures on Curetes Street. Some identify the figure as Medusa, symbolically keeping evil spirits away. The library of Celsus is an ancient Roman building in Ephesus, Anatolia, now part of Selçuk, Turkey. The Celsus Library in Ephesus (177 AD), had shelves for 12,000 scrolls and a secret passage to the high-end house of prostitution. Amphitheater and harbor street. It had a capacity of 1500 spectators. After lunch, heading to Pamukkale. Pamukkale is a spectacular place and natural site in Denizli Province in southwestern Turkey. Pamukkale, mean “cotton castle” in Turkish and the place is classified by UNESCO. Carbonate minerals, that have been left by the flowing water. 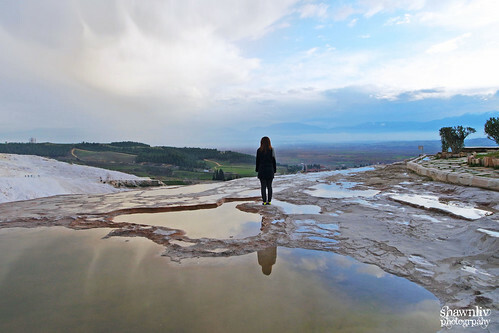 Panoramic view of travertine terraces at Pamukkale. Next, proceed to Lycus River hotel to spend a night and having our dinner there. Overall, I like our room and the hot spring pool (both in door and outside). Our room and toilet were small but clean. The bed was comfortable and there was fresh fruits basket (FOC) for guests. They provided breakfast and dinner and the food just normal.